I'm Will Goodman and I'm a guide that loves to spend my summers on the lake noodling for catfish. I have several years of experience and many holes for people to try. 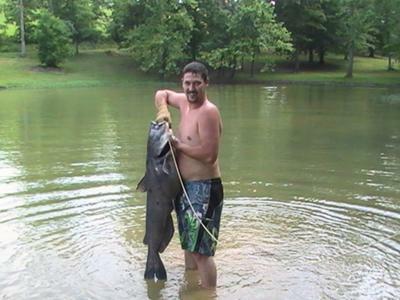 We offer some of the most pristine and successful catfish noodling/grabbling experiences in the country. We are nestled in the hills of East Tennessee where the true hillbilly handfishing takes place. And we definitely will not stringer the fish for you. We will leave the noodling up to you after we show you where they are. The thrill that comes with the first time a catfish bites your hand is more than words can describe. Big TN Cats is located in Sweetwater, Tennessee. We have some of the greatest fish and wonderful scenery to be be found throughout the United States. 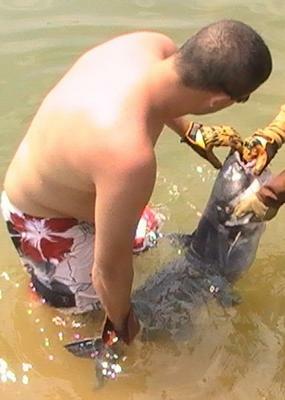 We provide guided noodling adventures for individuals of all ages. Our rates depend on how many people are going on an adventure. We have a lot of open dates currently, however, they are filling up fast as the season draws nearer! We always keep safety in mind as this is considered and extreme sport.